What makes our salon robes last so long? In the sewing world how many stitches per inch of fabric make a difference if you want your salon robes to hold up for years and years. We always set our machines at 10 to 12 stitches per inch which gives the seams extra strength. We also use a heavier thread on all sewing operations. We also Bartack the belts onto the back of the robes so they will not loosen in the wash. What is a Bartack? 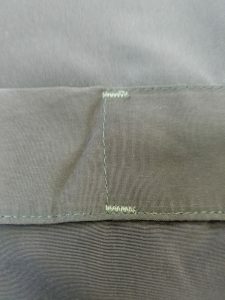 It is those tight stabilizing stitches that you find at the top of your jeans pockets and at the end of the fly of your jeans. I have attached a picture so you know what to look for. 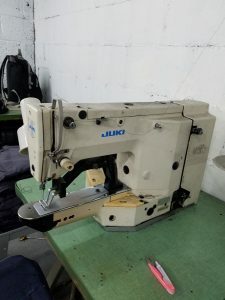 The Juki machine is what makes those stitches that look a little like a zigzag stitch. Every belt has 4 of those , one at each corner so it really holds! ← Salon Aprons Are NOT All The Same!